Which .45 bullet / mold? I've been looking at molds for .45 and have seen that the most often used molds seem to be the original or copies of the H&G 68,78, or 130. Can anybody share the pros and cons of each design? Is there a commercially available bullet that is a better choice than these? Are the swaged commercial bullets more accurate than cast? Re: Which .45 bullet / mold? 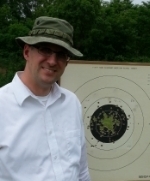 I have shot 2650's in the same pistol (Kart barrel) using soft Hornady swaged bullets and very hard cast Magnus bullets . My experience is reloading technique, powders and primers effect accuracy more when using well made bullets of any type. I pick the bullet weight by the feel of recoil in my hand for timed & rapid. In slow fire I want an accurate load and feel isn't too important (no need to recover for the next shot). My recipe = #68's @ 50yds and #130's at 25yds. The H&G 68 is very popular as is the Lyman 452460. I have the Lee copy of the 68 as well as the Lyman, and both cast easily and are accurate in my SA Range Officer. With either bullet OAL is critical for reliable feeding, but once you break the code on OAL they work well in most 45s. Lymans show up used in the $40-50 range and will need handles, Lee can be had new for less than $20 (with handles) and the 6 cavity for about $40, although the 6 cav uses separate handles. I cast mine from straight range lead and size at .451 with the old NRA formula Alox lube, and taper crimp. Depending on your choice of primer and powder you can send them downrange for 5-7 cents each. As to whether they are better or worse than commercial I have not tried any of the commercial offerings. Rich, do you lube your bullets in a lube/sizer or are they good to go right out of the mold +alox? The old Speer 200 gr swaged was more accurate than cast, no hidden air bubbles. Used at 50 yards for slow fire. The Lyman 200 gr bevel base has been my most accurate of the cast. But lube is left on the bevel when sizing in my Lyman 450. The excess lube needs to be wiped off. Rob, I use a Lyman 450. Missouri Bullets makes an exact duplicate of the 130. So I either cast my own from a Saeco mold of the same design or buy theirs when i haven't had time to get to the melting pot. Great bullet with an impressive pedigree. I started casting in the old days before info on sizing was as readily accessible as it is today, wisdom then was size to groove diameter. The commonly listed dia. 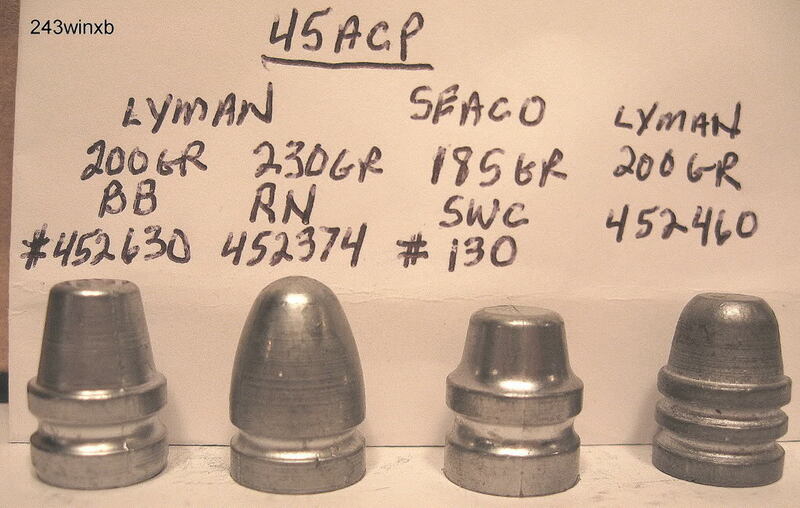 for 45 ACP is .451, so that was what I bought. Lyman Cast Handbook also recommends this size. Sizing larger might improve accuracy of the RO, but limiting factor here is arthritis and eyesight. Sizing larger won't help that. The mould that Rich/Wis recommended is a .452 mould. I'm sure that if his gun didn't like them sized to .451, he wouldn't size them down to that size. I've found that every bullet that I have used that is based on that H&G 68 design is super forgiving and there is likely multiple paths to success with that bullet design. Jacketed bullets should work best with actual bore size. You can use a pure lead fishing sinker.500 size or brownells sells a 45acp slugging kit. kart barrels and other national match I have slugged were .451, so .452 lead shoots best and .451 fmjs shoot best. I have a number of #68 copies in both flat and beveled base, I prefer the flat base. The last one was a group buy on the Cast Boolits forum that were machined in Europe somewhere, six bangers. I use the harder lubes that require a heater under the lubesizer, I have a Lyman 45. I would never go back to using the 50/50 stuff. Commercial bullets are all hard lubed, at least I haven't heard of any that use soft. For the poster using beveled base bullets.... take a meat tray (the Styrofoam ones that your steaks come on), put it over the die of your lubrisizer and run the handle down. It will punch out a gasket and seat at the bottom of the sizer and will seal around the bevel to keep lube out. It should be good for a dozen or so bullets, when the bevel starts showing lube, pick out the Styrofoam and punch out another. Works with any type of lube. If arthritis is a problem try the light 160 grain bullet. It's popular in OH, especially Oak Harbor & Canton. Original was an H&G #242S (hort) which was a 165 grain. The casting machines yield a 160 gr. 4.2 grns of BE and a 10 or 11 lb Wolf recoil spring is a mild, accurate load. This is used with a slide mt red dot. Often a long ejector is required. We have had good luck with them at the 50 yd. line. May have to go that route, although the problem is not so much recoil as it is in maintaining a consistent grip. I don't compete any more and only fire fifty rounds of 45 when I go to the range. I usually load 2 mags with 5, then shoot one mag and pick up my brass and then the other mag and pick up brass. Reload the mags and start over. One thing I started doing that helps is take some Tylenol and Aspirin about an hour before I go, amazing the difference it has made. The club I belong to is 11 miles from my house and I go 3-5 times a week. Shooting at this pace, BS'ing with other shooters, collecting range brass and just loafing I can kill the better part of two hours shooting 50 rounds. Yep, I still have that H&G mold, and it is a very good bullet for me. And I'm one of the Canton people. You may want to look at NOE Molds. Swede has versions of the #130 and #68. They are very high quality at a reasonable price. They also sell a good mold thermometer and can drill your mold to accept the probe. This helps in casting bullets that are a consistent weight and diameter. They have a useful forum associated with their operation where you can get good advice on casting techniques. The most accurate .45 cast bullet for me was the RCBS 452-201-KT. The catalog now calls it 45-201-SWC, so it may have changed. Plain base and very accurate. The rest were lost in the dust.